HIGH QUALITY BEST 2016 FITNESS PRODUCT – Train using your own bodyweight with gravity as resistance and exercise like a Pro. People love these products for a reason – they work! Comes with FREE work out PDF Guide Book to help you learn. This Peak Fitness Suspension system is a high quality, strong, durable and robust trainer and not to be confused with other inferior models which can be found for sale. Ideal for all types of athletes from yoga, pilates, to core workouts for bodybuilders and MMA enthusiasts. 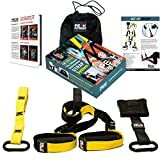 The Peak Fitness suspension belt is a great way to build your core strength or to perform resistance movements on practically all muscles using just your own body weight. You can perform over 100 exercises using this system and it is a great way to improve your flexibility, balance, cardio and body control. It is the perfect aid to help up train your core, build lean muscle and burn fat. High quality, lightweight and low-cost home training gym. Compares with far more expensive systems but is strong and built to last! Improve coordination, balance and get trim as you pull, stretch and extend. Do exercises like squats, plank, rows, bicep-curls, lunges and more. Work your arms, biceps, abs, back, chest, core muscles and more. Workout just about anywhere. Indoors using a door anchor, or out doors in a park using a tree or lamp post. This training system is portable and travel friendly as it is easily carried in the bag included. Develop home gym routines and create your own 15 to 30-minute circuit training workout plans. Order Now Risk Free. 100% money back LIFETIME guarantee. This great bit of kit gives you the ability to use your own body weight to help develop your core, to make it strong and define muscles. Training with this gear can help you build strength, endurance and flexibility. The suspension trainer is made from high quality materials allows you to train and excercise on your own schedule virtually anywhere. Peak Fitness proves no quibble returns and FREE shipping so that satisfaction is guaranteed.